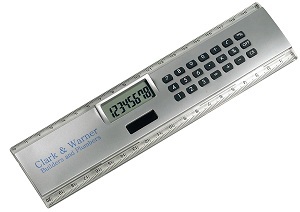 Calculator Ruler - Express Corporate - Promotional Products - Delivered Fast! 20cm plastic ruler with integrated calculator. Stylish silver effect colour with a large print area. Clear LCD display.